The three most successful drivers in the British Touring Car Championship field took a win apiece in a thrilling triple-header at Donington Park. With seven drivers’ championships between them it was the class of Jason Plato, Colin Turkington and Matt Neal that rose to the surface on a brilliant day of racing in Leicestershire. Left slightly disappointed that he couldn’t convert his superior free practice pace into pole position, Team BMR’s Plato wasted little time in reaching the race one summit. He immediately blasted by Gordon Shedden’s Honda Civic Type R off the line and had enough grunt in his VW CC to be nudging the sister car of Turkington into the first corner. Reigning champ Turkington held on for much of the opening lap but eventually had to give way to Plato on the run to the final chicane. Plato powered away by more than a second before sustaining the gap for the remainder of the race. Attention turned to the battle for second which resulted in some epic mid-race action. After trading places, Shedden’s Honda slid slightly wide at Redgate on lap seven and Turkington promptly angled his VW down the inside of the Japanese machine. The Ulsterman only held the position for a split second, however, as his Honda rival fought back brilliantly by returning the favour on the run to the Craner Curves. The Scotsman managed to keep the #1 car at a relative arm’s length until the finish and celebrated second by also setting the fastest lap. The new lap record holder would now start race two from pole position ahead of Turkington. Team BMR’s Turkington made it by the pole-sitting machine of Shedden on lap one, and although the pair scrapped ruthlessly early on, the VW eventually pulled away to take a comfortable victory. WIX Racing’s Adam Morgan took his first podium of the season to complete the rostrum. Such has been the competitiveness to the start of the 2015 BTCC season that Turkington became the fifth different driver to win in the opening five rounds. It was to be Matt Neal who earned bragging rights as the first double victor of the year after he came out on top of a relentless multi-car battle in the final bout. Power Maxed Racing’s impressive rookie Josh Cook started the race from pole position and despite losing out off the line to Rob Collard’s BMW, he soon re-passed and did an absolutely stellar job at the front for the first few laps, but his hard work was soon to be undone. The race was neutralised on lap six when Sam Tordoff’s BMW and Jack Goff’s MG had a coming together at the final chicane. Both cars were fired off into the gravel and out of the race with the Safety Car being deployed to allow marshals to retrieve both stricken vehicles. This eroded Cook’s lead and set up a spectacular end to the day. There were changes aplenty behind as Plato’s VW, Jordan’s MG and the Mercedes of Morgan tussled in the early stages. Aron Smith had already blazed a trail from 12th on the grid up to third prior to the incident and was into second shortly after the restart. He immediately reeled in the race-leading Chevrolet of Cook ahead of him which led to a pulsating scrap over the following few tours. The pair touched through the ultra fast Craner Curves and both cars bounced across the grass in dramatic fashion. The wild sliding VW of Smith made it back onto the track right amongst the chasing pack while Cook rejoined behind them. It was an incredible escape for both drivers but the episode left Collard out front. Neal, who had already clashed with Jordan’s MG at the Old Hairpin, hauled in the WSR car and squeezed his Honda into the lead with just two laps to go. Jordan made it through too and he was eventually sandwiched between two Hondas as Shedden made the last step on the podium after his own stellar drive from 14th on the grid. Collard claimed fourth ahead of an incredible drive from teenager Aiden Moffat. Not only did the Mercedes youngster make the most of the incidents ahead of him but he also made impressive late moves by previous race leaders Smith and Cook. Despite his dramas, Cook takes the lead in the Jack Sears Trophy table. Neal leads the standings by two points from Turkington, with Shedden a further five points adrift in third. Honda takes the lead in the manufacturer/constructor standings, while Team BMR head the teams’ table. The championship now heads to Thruxton in Hampshire on 9/10 May. 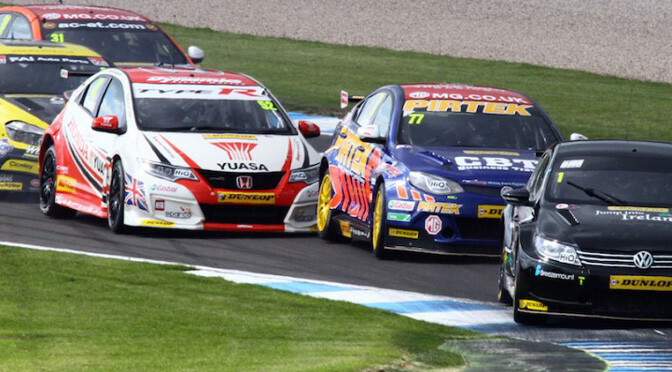 The 750 Motor Club finals weekend took place at Donington Park with a busy 24 race programme which was action-filled. Jeff Humphries got off the line quickly in the opening K-Tec Racing Clio 182 Series race but went sideways at Redgate allowing Matt Fincham and Patrick Fletcher through. On the fourth circuit Fincham was caught out by the slippery track and Fletcher took the lead. The pair were nose-to-tail in the closing stages with Fincham overhauling the former Stock Hatch champion with 50 metres to go. Ed Pead, who won 17 times in the Clio Cup, started from the back and clawed him way up into the top five on the final lap. Humphries led every lap of the second encounter after seeing off various different challenges. Pete Morgan battled Humphries at the beginning and end of the race but could never pass him. Matt Digby was able to overhaul Humphries but as soon as he did, he lost his wheel and his Clio fell onto its side. Patrick Fletcher joined in the battle for the lead and finished third but only 0.5 seconds off of the victory.